For almost a month, “Jeanne” smelled cigarette smoke in her Burlington apartment, but she couldn’t pinpoint the source. She figured a fellow tenant was breaking the building’s “no smoking” rule. She decided to investigate anyway. Walking around the perimeter of the house, a four-unit Victorian on Buell Street near the University of Vermont, Jeanne noticed a light in the basement. What happened next so unsettled the 34-year-old woman, she only agreed to share it on condition of anonymity: Two homeless men ambled out of the basement, where they’d been residing with their buddies for several weeks. “I was, like, ‘You guys got to get out of here,’” recalls Jeanne. She agreed not to call the cops but did contact the building’s property manager, who discovered the squatters had furnished the asbestos-laden cellar with a sofa, a mattress and a chair. He also reported finding empty bottles of whiskey, vodka and beer. The property manager put a new lock on the basement door. The squatters returned twice that night — unsuccessfully — to try to collect their belongings. The next day, October 15, another homeless man knocked on Jeanne’s door at three in the morning. He begged her to let him in the basement to get his stuff. The Buell Street cellar dwellers illustrate a growing problem in Vermont. Over the past few years, the number of homeless people has increased dramatically. Whether by misfortune or by choice, more Vermonters — particularly families with children — are living without a roof over their heads. Every January, Vermont service agencies participate in the Winter Census, also known as a point-in-time survey, that counts the state’s homeless population in shelters and encampments across the state. In 2008, the number was 2286; today it’s 2782. In Chittenden County, where most of the state’s soup kitchens, food shelves and service agencies are located, the homeless population has more than doubled in two years — from 424 in 2008 to 916 this year. The number of children in those totals jumped from 86 kids two years ago to 256 today. That gives Vermont the highest homeless rate per capita in New England, according to Burlington-based Committee on Temporary Shelter, which operates five emergency shelters for families and single adults. On Monday, COTS announced its intention to purchase another for its program offices: the prominent Burlington College building at the intersection of North Street and North Avenue. Rita Markley, executive director of COTS, blames the trend on a lack of affordable housing and the impact of the recession. For the past decade, she says, wages have remained flat, even as the price of health care, rent, utilities and gasoline continued to climb. For many Vermonters, the result has been financially ruinous, she says. Markley could have anticipated the newest trend: homeless squatters. “Given the rise in the numbers of homeless and the diminished resources statewide to meet the needs, it’s not surprising that might happen,” Markley says. Developer Anne Rothwell has spent thousands of dollars trying to keep uninvited guests out of the vacant house she owns at 189 South Champlain Street. 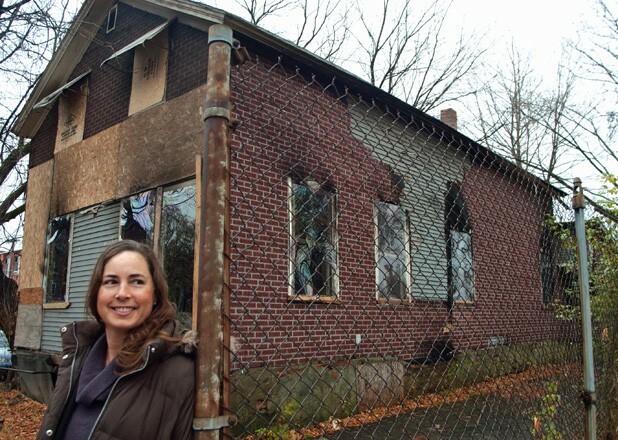 She’s battling city hall for a permit to demolish the structure so she can rebuild, but the city won’t grant her one without a specific redevelopment plan. While Rothwell seeks investors, the house attracts trouble. In the two-plus years Rothwell has owned the house, squatters have ripped plywood and polycarbonate off the windows and doors more than a dozen times, she says, and littered the inside with beer cans, used condoms and drug paraphernalia. One even ran an extension cord from the house out to a shed where he had set up camp. Last December, someone broke into the house and started a fire — for cooking or to keep warm, Rothwell suspects — igniting a blaze that all but gutted the structure. Burlington police acknowledge they’re fielding more complaints than ever about homeless and intoxicated persons camped out in “semiprivate” areas such as porches, stairwells and ATM vestibules. Trespassing complaints to police have nearly doubled since 2007, according to Police Chief Michael Schirling, from 505 three years ago to almost 1000 this year. Not all those complaints relate to homeless or transient individuals, Schirling stresses; a drunken college student wandering into the wrong apartment, or someone violating a trespass order at the mall, would also trigger a trespass complaint. But the chief says that “anecdotal” evidence suggests homelessness is behind many of the violations. Currently, there’s a two-month wait for beds at the family shelters run by COTS. The agency issues motel vouchers to qualifying families it cannot accommodate. However, the two shelters for single adults — the Waystation on lower Church Street and the Eagles’ Nest on St. Paul Street — are not at capacity. Markley guesses it’s because of the shelter’s rules. COTS guests must be sober, engaged in a job-seeking activity and actively saving a percentage of whatever money they make. Faced with those restrictions, some would rather sleep outside, Markley says. Young says he’s heard of people crashing on porches or in barns, with permission, but says more common are homeless encampments in the woods, such as the one where Jose Pazos, the man accused of murdering Burlington resident Kathleen Smith, allegedly lived for years. “Many people say, ‘The only time I feel homeless is when I’m sleeping in the shelter,’” Young remarks. “If they’re sleeping in a door,” or in a wooded campsite for that matter, “they don’t feel homeless,” he adds. A new, sturdier lock on the basement door of her apartment gave Jeanne some comfort. But on Tuesday morning, she found the lock had been broken again. This time, she called the cops.